Besides living life on a budget or getting out of consumer debt, one of the best things you can do financially is to focus on drastically increasing your income. You already work hard. You trade hours of your life for a paycheck from someone else and maybe they don’t offer over-time opportunities and getting a raise anytime soon is probably not going to happen. If this is you, and you’re wanting to boost your income you really have 2 options. First, apply for new jobs that pay more than your current job. Who cares if you meet all the qualifications on the job description? Make your resume pretty and just go for it! You may just talk someone into a new position that pays you double what you’re currently making. That may be a good option, especially if you’re working toward that type of job for your long term career. But maybe you just need a quick boost in income for a short time period to help you reach some other financial goals like getting out of debt, or building a savings account. Here are the steps I would take if I needed to boost my income quickly. Substitute the business I use as an example for whatever you would like to do. Create a simple business card for “Casey’s Lawn Service” and spend $50 to print 500 of them. Go to an upscale neighborhood in my area and place my business card on the front door of 500 homes. Let’s say I got a terrible response rate from this of 1%. That means 5 people call me to come mow their lawn. That would be 5 people paying me about $25 a week, for 6 months. That’s $500/month for the next 6 months! Not too bad for a few hours of work. Now, if I really wanted to get a better return, I’d step outside of my comfort zone some and here’s what I’d do. Go to an upscale neighborhood in my area and knock on 350 doors. I’d then let them know that I mow lawns in their neighborhood and that I’d love the opportunity to take care of their lawn and landscaping for them. I’d tell them that the cost is $25/week. If their lawn needs mowed while I’m there, I’d offer to do it right then for them. Billy will likely hire me. If he doesn’t at that point, I’ll shake his hand and move on to his neighbor. Notice I saved 150 cards above. 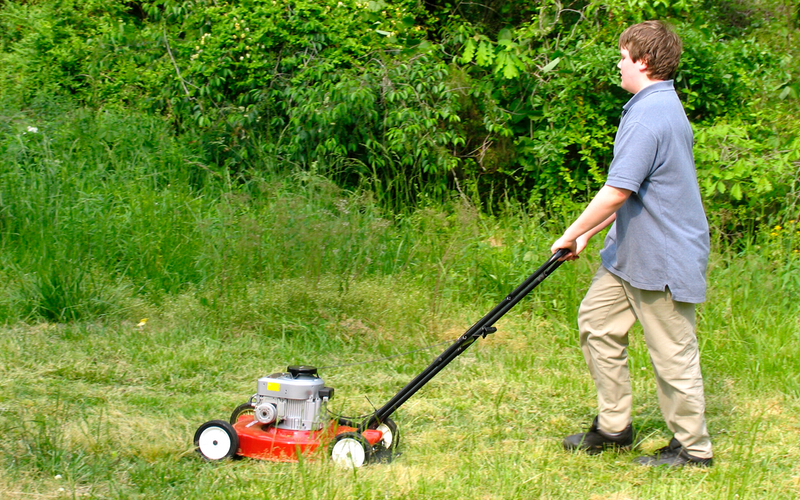 Every time I mow a lawn in the area, I will go to the neighbors that are immediately around my customers house, knock on the door, and tell them that I take care of their neighbors yard and ask if I can provide their lawn care service too. In my sales experience from the past I know that this process is going to bring about a 20% response rate. That’d be 100 homes. At $25 a week. For 6 months. That’s a $60,000 a year business. As a bonus, all of the work is in a small serviceable area, so I don’t have to drive all over. I probably couldn’t take care of 100 homes all by myself. I especially couldn’t do that many if I had a full time job as well. I’d need to hire some help, but that’s okay because I’m making an extra $5,000/month. Sometimes businesses get accidentally started this way. So whether you’re looking to boost your income to reach a short term financial goal or you’re looking to start up a new project, it is absolutely possible to create more income with a little bit of effort. What type of side income are you thinking about trying? Brilliant approach to almost any business. Will have to employ this tactic when I finally start my eh hem side business. My husband’s favorite job in college was a landscaping business he started with a friend. He quickly learned that his dead end food service jobs could not compete! Pretty soon they were taking on more and more work and even broadening their original business model to include remodeling homes. Long story short, it paid for his college expenses and then some. Go small businesses!